According to the British Plastics Federation, the use of uPVC windows has grown dramatically over the past 15 years. In fact, over 85 per cent of new and replacement window projects in the UK use uPVC instead of traditional materials such as wood. This is primarily because of the impressive attributes of uPVC as a building material. It’s water resistant, fire resistant, completely recyclable, extremely durable, and won’t warp, rot or rust in adverse weather conditions. Even so, a little bit of occasional maintenance is recommended if you want your uPVC windows to last as long as possible. With this in mind, here’s a quick guide on how to look after them. You should be visually inspecting your uPVC windows at least two or three times a year to check for potential problems, paying close attention to the seals for signs of wear and tear or damage. Also, examine the hinges and locks to ensure they work properly. If they are a bit stiff, apply some lubricant such as WD-40. More complex problems should be looked at by a professional. The same goes for windows that are too high to access safely. Even though there is a good chance you are cleaning your uPVC windows anyway, this piece of advice needs reiterating. Getting rid of debris, dust, and dirt will ensure the smooth operation of hinges and maintain the insulating properties of the seals. Start by opening up your windows and loosening dirt with an old paint brush, which can then be vacuumed easily. With no dust or debris present, you can start wiping down your window frames using a soft white cloth and soapy water, particularly around the edges where the window rests inside the outer frame. Don’t use harsh chemicals or ammonia-based cleaners – If dirt is stubborn, opt for a top-grade solvent uPVC cleaner instead, which can be purchased from a hardware shop. However, do not use solvent cleaners on the silicone seals, as they could damage or even lift off the surface. Don’t use abrasive materials – Scouring pads and abrasive sponges could leave uPVC windows with marks and scratches, which are often too deep to remove through polishing. 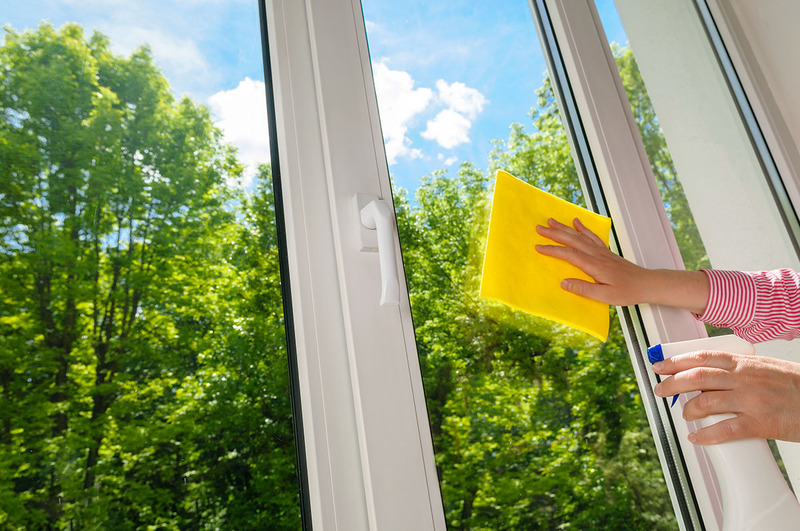 Don’t use a coloured cloth – Due to the nature of some cleaning products, the colour could run and come off on the while plastic of uPVC windows. Again, most people will clean their windows regularly. But to ensure the glass always looks good, consider doing so every month. A traditional glass cleaner – Apply directly to the glass with a high-quality cloth that won’t leave fibres behind. Polish with a dry micro-fibre cloth. An ‘e-cloth’ – An increasingly popular option that avoids the use of cleaning products. E-cloths are often kinder to the environment and deliver better results too.